Telecommunications, broadband, and other service providers that want to attach to utility poles are struggling with an archaic method for route mapping. Many lack access to comprehensive, accurate data about existing utility assets in a specific area, along with asset type and condition. The only option has been to request asset data from utility companies. Those requests may be denied or slow. A request to attach is then submitted, and the utility or other asset owner then sends its own staff to the field to verify what can be attached by performing pole loading tests. The current method of route mapping is analogous to opening up your car’s glovebox and unfolding an old fashioned paper map to find your way, rather than opening up Google Maps on your mobile phone. This challenging lack of access to infrastructure data is one factor behind the lag in broadband deployment across rural areas of the U.S. If a broadband company runs fiber 20 miles down a road with only two houses on it, there is little return on their investment. However, if that road ends at a large residential subdivision and an office park, then the investment is worthwhile. Similarly, a cable company building out of its network can choose to expand from the central downtown in any direction. How can they determine whether it’s best to go north, south, east, or west? And once the direction is identified, how can they determine the optimal route from one point to another considering all of the potential options (poles, conduit, and trench)? 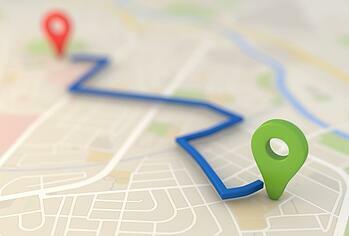 In the analogy mentioned above, the old way to route mapping is a paper map, while a shared, centralized asset database is the equivalent to Google Maps. With access to a shared asset database, attachers can quickly and accurately identify existing poles or underground conduit in the area to determine an optimal deployment route. At the same time, asset owners should be able to maintain complete control over their asset data: they can choose to share only data on the asset location and owner, or they can share more information such as height, condition, class, pole number, or birthmark to help with asset verification and speed up the permitting, make-ready or transfer processes. To address the concerns of lagging broadband deployment in rural and sparsely populated areas, asset data can also be cross-populated with information about relevant government subsidies and grants in those regions. Making shared data easily accessible to all joint use parties can aid faster deployment, and help address inequities in broadband access.